Colin Powell is most well-known for serving the United States as the 65th Secretary of State under George W. Bush. He was nominated by Bush on December 16, 2000 and was unanimously confirmed by the United States Senate. He was then sworn in on January 20, 2001. 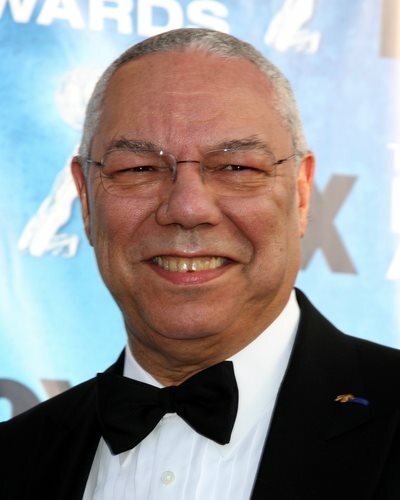 Colin Powell was born from Jamaican immigrants on April 5, 1937 in New York City. He was raised in the South Bronx and was educated in the New York public education system ultimately graduating from City College of New York where he obtained an undergraduate degree in geology. During his time there, Colin Powell participated in the ROTC and received a commission upon graduation in the spring of 1958 as an Army second lieutenant. Powell then continued his education at George Washington University where he received his Master of Business Administration degree. Colin Powell also served as a soldier for 35 years in the United States military, where he ultimately reached the rank of 4-star general. Powell acted as captain during the Vietnam War as well as a lieutenant colonel in South Korea. He also was awarded a White House Fellowship under President Nixon, and under the same administration was assigned to the Office of Management and Budget. While still in the Army, Colin Powell served as a national Security Advisor under the Regan administration. He then briefly served as the Commander in Chief under George H.W. Bush administration. His last assignment in the military was from 1983 to 1993, where he acted as 12th Chairman of the Joint Chief of staff. This position is considered the highest possible position in the Department of Defense. He was the first Afro-Caribbean American to ever hold this position. During his time as the Chairman of the Joint Chiefs of Staff, Colin Powell took oversaw 28 crises. This included the invasion of Panama in 1989 as well as Operation Desert Shield and Desert Storm during the Persian Gulf War in 1991. A short time after, Colin Powell retired from his military career. Before taking on his role as Secretary of State, Colin Powell worked as the chairman of a national nonprofit group called America’s Promise – The Alliance for Youth. It was here that Powell worked to mobilize people from all parts of American life in order to build and strengthen the character of young Americans. When President George W. Bush appointed Colin Powell as Secretary of State, Powell became the highest ranked Afro-Caribbean American in the Government. As Secretary of State, he acted as the President’s Chief Foreign affairs adviser, carrying out the President’s foreign policies. Colin Powell has received several civilian awards, including the President’s Citizens Medal, two Presidential Medals of Freedom, The secretary of State Distinguished Service Metal, The Congressional Cold Metal, and the Secretary of Energy Distinguished Service Medal.